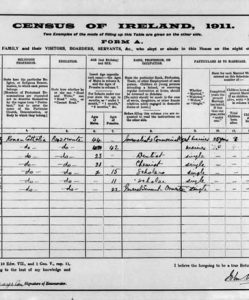 A Census of Ireland was taken every 10 years from 1821. Complete sets of enumerator’s returns, the original manuscript forms from which the printed census reports were compiled, have only survived for two years – 1901 and 1911. The census for County Monaghan is available online from the National Archives and on microfilm in the County Library, Clones.